Energy efficiency in buildings is a sustainable trend that is being implemented at large in the construction world due to its multiple benefits, the main one being the prevention of energy waste. 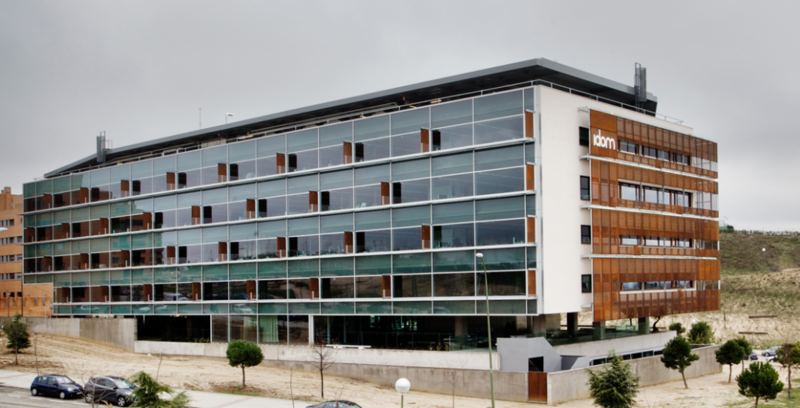 As an example of a building designed specifically to be energy efficient, let me introduce you the headquarters of IDOM in Madrid. The assignment implied building a space that housed IDOM’s activities while becoming the physical representation of the company. They aimed to explain their culture and working proccesses through this headquarters. It was an opportunity to create a building that showcased their philosophy. The idea of this building was to recreate the working conditions of a comfortable home, overcoming the limitations of the 20th century traditional office, specially regarding articifial conditioning and iconic brand image. In order to switch from one model to the new one, a profoundly different approach was needed. It became mandatory to make energy, conditioning, lighting, orientation, water and space management, and the sustainable strategies the pillars on which the architectural decisions were based. The conditioning was made using thermally activated building systems (TABS), taking advantage of the high thermal inertia of the structure. The air-handling system was exclusively conceived for low-speed renovation through washable fabric pipes and without noise pollution. There are big structural lights that allow the space to be more fluid and flexible. In this environment, pieces of nature, hanging gardens and green façades can be found, together with a correct water re-use strategy, designed for both an accoustic and visual journey. This building has a reasonable cost, easy maintenance, it is simple to use and understand, flexible, adaptable to changes. In sum, it has a complex conception and a simple resolution. This building had to be rigourously sustainable, correctly balaced regarding environmentally-friendly, economic and social aspects, which means that people should be able to work in healthy conditions (no cold, no heat, no brightness, no toxic elements, etc. ), to ensure high satisfaction levels and a healthy environment. However, many buildings were not designed taking into consideration the above mentioned criteria, which is why there are new technologies being developed to change this situation. Luckily, some companies are starting to realize the importance of the energy efficiency in buildings and want to undergo vital changes in their headquarters, offices, and warehouses. This is the case of the warehouse at the Central Fish Market in Mercamadrid. If you would like to participate in the insulation project of this warehouse, read the terms and conditions here.